Ever since we have moved into this house, we have affectionately called the bathroom that we are remodeling, the Barbie Bathroom. Our three daughters prefer this bathroom. Of course, it is so feminine. It also stays a whole lot warmer than the other bathroom. Now, the only thing that remains of Barbie, is the shower tile. 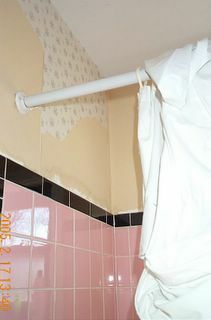 We have even removed the whole top layer of the pink flowered wallpaper. We have decided to leave the pink shower tile for just a little while, as to not place too much change on the girls all at once, and because we can’t afford another project right now.